The GTO/PRO Battery Heater is designed to maintain the batteries in the control box at a higher temperature when the system is installed in a cold climate. Cold temperatures can inhibit the normal functioning of a battery, thus affecting the operation of the gate. The heater is easy to install and wire, and controlled by a built in thermostat that activates the heater at temperatures below 40°F (4°C). 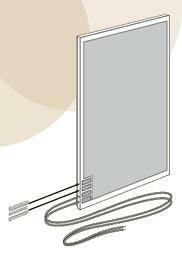 One or two heaters can be used depending on the number of batteries installed in the control box. Power for the heaters is supplied by the incoming 18VAC transformer up to 500 feet from an AC power source. Single battery systems more than 500 feet and dual battery systems more than 300 feet from the AC power source can be powered by a separate transformer. The heaters will not work on solar powered applications. The heaters are designed to be used with the Mighty Mule 500, Mighty Mule 502, PRO-SW3000, PRO-SW4000, PRO-SL-1000, PRO-SL2000, and other gate operators.